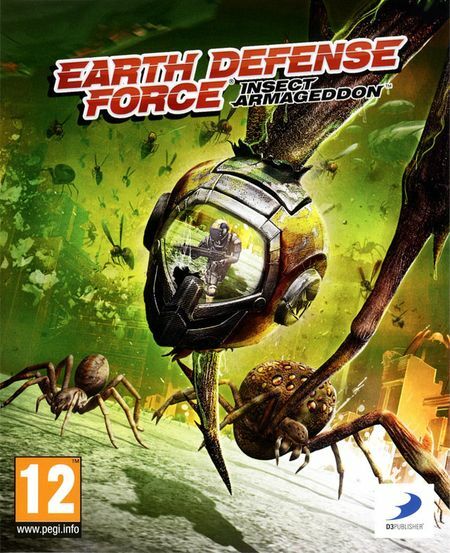 Earth Defense Force: Insect Armageddon is a third-person shooter developed by Vicious Cycle Software, and published by D3 Publisher, for the PlayStation 3, Xbox 360 and Microsoft Windows. It is the sequel to Earth Defense Force 2017. * Over 300 weapons: assault rifles, rocket launchers, energy weapons, sniper rifles, grenade launchers and more! * Massive replayability through arcade style scoring, tons of weapons to collect, and multiple difficulty levels in every game mode! The player defends a fictional city called New Detroit against an alien invasion, aided by bio-engineered terrestrial insects. The Player goes by the name of 'Lightning Alpha', leader of an elite team of fighters, known as "Strike Force Lightning." Along with two squad mates, Lightning is (usually) aided by local EDF fighting forces in the area, though they are little more than cannon fodder compared to Lightning. The story is divided into three separate chapters, which are divided into five separate missions. The first chapter is akin to an introduction to the game, while the second chapter has Strike Force Lightning moving across industrial New Detroit to discover the fates of several downed Landers scattered across the city, as well as their pilots and cargo. Only one of them is salvageable, and it becomes piloted by the cool-headed Captain Sully, a character that returns in later missions. The third chapter follows the story of Lightning finding and transporting "The Cube" to a nest in central New Detroit. Before it is deployed, an Ant Queen emerges from the nest, forcing Lightning to do battle with it to secure the drop zone. Once the Queen and her minions are dead, "The Cube" is dropped in the middle of the nest, and Lightning quickly makes their way to the evacuation zone. As their transport Lander is about to begin its descent, a new Ravager ship (akin to a much larger and more heavily armed version of a Ravager Carrier) appears in the skies, downing the Lander. Lightning rendezvouses with Echo and X-Ray squads, EDF troopers who were stuck in Central Detroit without evacuation, and they make their way to another evacuation site where they must defend against several Hectors (large Ravager Mech Walkers) until they are rescued by Lander Captain Sully, who (at the time) violated an EDF No-Fly Zone without remorse. Players take the role of Lightning Alpha, who battles against wave after wave of deadly gigantic insect and robot enemies. Insect Armageddon predominately takes place in the city of New Detroit, the target of a concentrated bug invasion that only the EDF can stop. The graphics have been greatly improved, but still retain the arcade-shooter physics of its predecessor. Vehicle controls have been fixed, with improved tank and mecha vehicles that can be manned by more than one player. credits are accumulated in-game which is used for a wide variety of tasks. Over 300 weapons are available. These can be purchased using a new unlock system that partially replaces the in-game weapon drop system of EDF: 2017, though some weapons are only dropped by elite enemies. Four different classes are selectable from the menu, each with special functions and exclusive equipment. All armor colors can be customized. Trooper Armor: Trooper armor is the standard loadout for EDF soldiers. It has access to more weapons than any other class, and upgradable abilities that allow it to be a versatile, all-around unit. The Trooper Armor is also the only armor available in Survival Mode. Jet Armor: Jet armor is a suit Lightning Alpha can acquire to take the fight to the skies. It uses energy to replenish weapons. The jet pack allows the fastest movement across the map for any class but also the weakest protection. Tactical Armor: Tactical armor fulfills a wide ranging support role, and is the only class that can deploy turrets, mines and radar dishes. Stronger equipment is unlocked as the story progresses. Battle Armor: Battle armor transforms players into a veritable walking tank. Slow moving and hard-hitting, it comes equipped a portable energy shield and can equip some of the most powerful weapons in the game. Battle armor also can release its entire pool of energy in a massive electric blast, damaging everything unfortunate enough to be close by. Both split-screen and online co-operative play are included. A six-player Survival mode is also available, with a squad of EDF soldiers defending against endless waves of bugs. D3 Publisher of America also includes a Pain pack. The Pounds of Pain pack features 15 weapons mostly for the Battle Armor but also a few for the Trooper Armor and Tactical Armor, available from Gamestop. The Death From Above pack features 15 weapons mostly for the Jet Armor but also a few for the Trooper Armor and Tactical Armor as well, available from Bestbuy.